More information on the B&NES website. A mobile library service is provided by the B&NES Library. 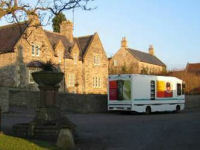 Two mobiles serve rural communities in North East Somerset and areas of Bath without a library building.